No matter what you call your team-based improvement effort (whether it's continuous improvement, total quality, lean manufacturing, or a self-directed work team), you are striving to improve results for customers. However, few organizations are totally pleased with the results their team improvement efforts produce. 1. Clear Expectations. Has executive leadership clearly communicated its expectations for the team's performance and expected outcomes? Do team members understand why the team was created? 2. Context. Do team members understand why they are participating on the team? Do they understand how the strategy of using teams will help the organization attain its communicated business goals? Can team members define their team's importance to the accomplishment of corporate goals? Does the team understand where its work fits into the total context of the organization's goals, principles, vision, and values? 3. Commitment. Do team members want to participate on the team? Do team members feel the team mission is important? Are members committed to accomplishing the team mission and expected outcomes? 4. Competence. Does the team feel that it has the appropriate people participating? For example, in a process improvement, is each step of the process represented on the team? Does the team feel that its members have the knowledge, skill, and capability to address the issues for which the team was formed? If not, does the team have access to the help it needs? Does the team feel it has the resources, strategies, and support needed to accomplish its mission? 5. Charter. Has the team taken its assigned area of responsibility and designed its own mission, vision, and strategies to accomplish the mission. Has the team defined and communicated its goals; its anticipated outcomes and contributions; its timelines; and how it will measure both the outcomes of its work and the process the team followed to accomplish their task? Does the leadership team or other coordinating group support what the team has designed? 6. Control. Does the team have enough freedom and empowerment to obtain the ownership necessary to accomplish its charter? At the same time, do team members clearly understand their boundaries? How far are members allowed to go in pursuit of solutions? Are limitations (e.g., monetary and time resources) defined at the beginning of the project before the team experiences barriers and rework? 7. Collaboration. Does the team understand the team and group process? Do members understand the stages of group development? Are team members working together effectively interpersonally? Do all team members understand the roles and responsibilities of team members, team leaders, and team recorders? 8. Communication. Are team members clear about the priority of their tasks? Is there an established method for the teams to give feedback and receive honest performance feedback? Does the organization provide important business information regularly? 9. Creative Innovation. Is the organization really interested in change? Does it value creative thinking, unique solutions, and new ideas? Does it reward people who take reasonable risks to make improvements? Or does the company reward the people who fit in and maintain the status quo? Does it provide the training, education, access to books and films, and field trips necessary to stimulate new thinking? 10. Consequences. Do team members feel responsible and accountable for team achievements? Are rewards and recognition supplied when teams are successful? Is reasonable risk respected and encouraged in the organization? Do team members fear reprisal? Do team members spend their time finger pointing rather than resolving problems? 12. Culture Change. 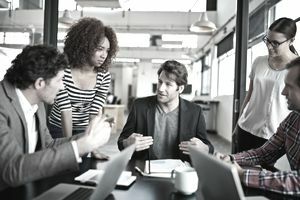 Does the organization recognize that the team-based, collaborative, empowering, enabling the organizational culture of the future is different than the traditional, hierarchical organization it may currently be? Is the organization planning to, or in the process of, changing how it rewards, appraises, hires, develops, motivates, and manages the people it employs? If you spend time and attention on each of these recommendations you will ensure that your work teams contribute as effectively as possible to your overall business success. It's a lot to do, but there's a lot at stake.